Iranian media users have been wondering how their supreme leader, Ayatollah Khamenei, manages to post Instagram videos exceeding the maximum time limit. It turned out it wasn’t because his speeches are so eloquent. The problem lies in a computer bug. Social media platform Instagram introduced a 15-second restriction on any video that users can post on their website in 2013. However, Iranian Supreme Leader Ayatollah Ali Khamenei placed several videos of his speeches lasting as long as 91 seconds. In his videos, he addresses the Iranian people and speaks on the nuclear deal, relations with Saudi Arabia and other issues. The ‘amazing gift’ of the Iranian supreme leader was noticed by journalist Pouria Zeraati from Manoto 1, an international Persian-language general entertainment channel. He asked on his Twitter account how Khamenei managed to bypass strict Instagram policies. “Dear leader, can you give us the magic code?” one user wrote on Twitter, following Zeraati’s joke. It turned out that 75-year-old Khamenei was able to post his long speeches on Instagram not became he is a supreme leader of Iran, or because he talks about the much-discussed nuclear deal. It was simply down to a computer bug. “We recently became aware of a bug that allowed some users to post videos to Instagram that are longer than 15 seconds. We worked quickly and fixed the bug,” Instagram told the Guardian. 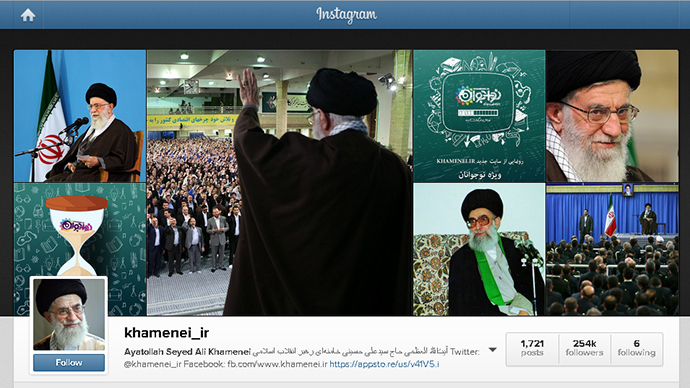 Nevertheless, Khamenei’s long videos remain in his Instagram account, despite the company’s statement.